How a website became the ultimate guide to key Russian art events in London. Next month’s Russian Art Week will mark the one-year anniversary of Theodora Clarke’s online initiative to promote awareness of Russian art sales and cultural events in London. The Russian Art Week website grew from her successful arts site, Russian Art & Culture, which she developed originally as a blog after organising a conference for curators and academics. Within a very short time, 50,000 people were reading the site to learn more about Russian cultural events. Russian Art Week, she says, was conceived as a way “to bring together commercial and academic organisations in a co-ordinated series of events twice a year. 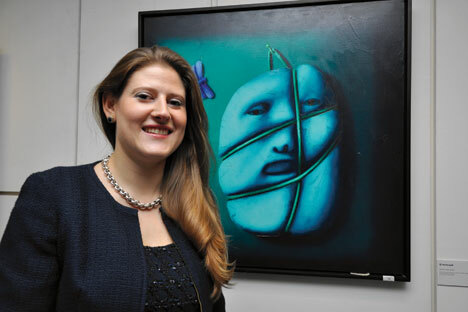 “Every year in June and November the major auction houses host sales of Russian art in London. However, I realised that if you are a collector coming from Russia, there was no central place to find all the information on what was going on,” she explained. Demand for Russian art is booming and Britain has become the centre of that market. The last event in June realised more than £50m in sales in just a few days at auctions held at Sotheby’s, Christie’s and MacDougall’s, says Ms Clarke. A number of exhibitions featuring Russian art coincide with next month’s event, from November 22-29, including one curated by Ms Clarke herself, the first UK retrospective of Boris Chetkov, a contemporary painter from St Petersburg. “The whole week is also a warm up event for the 2014 Russia-UK Year of Culture. The growth of the Russian art market in London and huge population of Russian émigrés in the country means that the year is sure to be a great success,” she says. IN PICTURES: "Russian Art Week in London, 2012"
Ms Clarke holds an MA in Russian Art and lectures widely on the subject. She fell in love with Russian art when she visited Moscow’s State Tretyakov Gallery as a 16 year-old on holiday. “Most people find it rather bizarre that I am British but that I set up and run a Russian project. I noticed that many people in the West are well acquainted with Russian music, ballet and literature,” she says. “However, I found that Russian art is simply not as well known here, apart from the great avant-garde painters, such as Kandinsky, Chagall or Goncharova.